Brock Osweiler hasn't been as sharp for the Denver Broncos as in 2015, when he led a victory against New England. FOXBOROUGH, Mass — In a way, Brock Osweiler can thank the New England Patriots for his biggest payday in the NFL. After the Denver Broncos’ quarterback beat the Patriots in 2015 – New England’s first loss that year – Osweiler picked up a $72 million contract in the offseason with $37 million guaranteed from the Houston Texans. After a terrible year and a trade to the Cleveland Browns, Osweiler was cut, setting up a return to the Broncos. 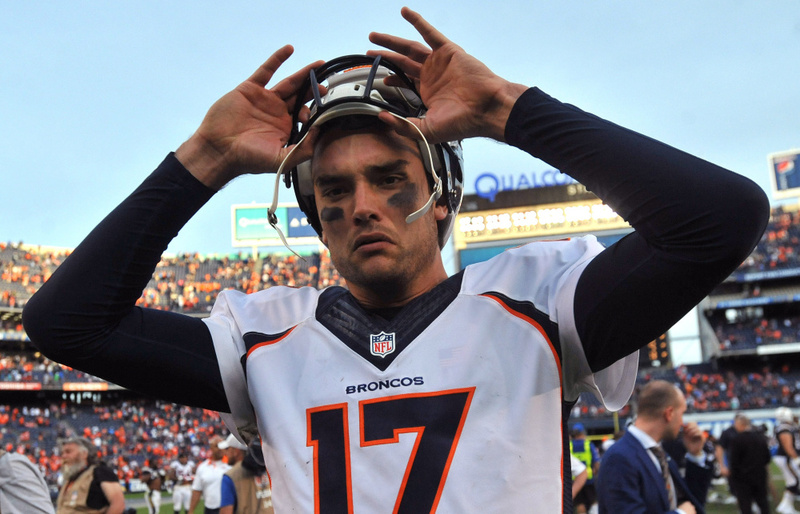 Unfortunately for Denver, Osweiler still isn’t very good. Osweiler took over at quarterback for the Broncos last week, throwing for just 208 yards, one touchdown and two interceptions in a loss to Philadelphia. His turnovers helped the Eagles take a huge lead, and his only touchdown – a 1-yard pass to Demariyus Thomas – came after his team trailed, 44-9. Since Peyton Manning retired, the Broncos haven’t had much of an answer at quarterback. Trevor Siemian was mediocre in his first season as a starter last year (3,401 passing yards, 18 touchdowns, 10 interceptions in 14 games). After throwing 10 interceptions and fumbling five times through seven games this season, the Broncos handed the keys to Osweiler in a desperation move. Osweiler is hardly a savior. Since the beginning of last season, he’s thrown more interceptions (18) than touchdowns (16). He’s completed just 58.3 percent of his passes and has only averaged 5.8 yards per attempt. He isn’t particularly mobile, and has poor accuracy on deep passes. But while the Broncos are 3-5 overall, they are 3-1 at home. IT DOESN’T look like New England will get any reinforcements for its linebacker corps. Shea McClellin wasn’t activated off the injured reserve at the team’s 4 p.m. Wednesday deadline. “We won’t be activating Shea to the roster,” Coach Bill Belichick said. According to multiple reports, the 6-foot-3, 250-pound McClellin suffered a setback after returning to practice 21 days ago. McClellin, who missed multiple games because of a concussion last year, was placed on IR in September because of another head injury. McClellin would have been eligible to play Sunday in Denver and his return was coming at the perfect time, coinciding with Dont’a Hightower’s going down with a season-ending pectoral injury. Although McClellin doesn’t play at the same level as Hightower, he would give the Patriots another veteran piece at a time of need. The setback hurts the Patriots in a few different ways. Now they’ll move on with Kyle Van Noy, Elandon Roberts, David Harris, Marquis Flowers and Trevor Reilly at linebacker. A Boise State product, McClellin was the Bears’ first-round pick (19th overall) in 2012. He signed with the Patriots as an unrestricted free agent in 2016 after spending four disappointing seasons in Chicago. Appearing in 14 games with the Patriots in the 2016 regular season, McClellin had 39 tackles, one sack and recovered a fumble he returned for a franchise-record 69 yards. He appeared in all three of the Patriots’ postseason games with two tackles in the Super Bowl victory against Atlanta. THE PATRIOTS signed defensive lineman Ricky Jean Francois to fill the spot on the 53-man roster that opened up when Hightower was placed on injured reserve. Jean Francois, 30, is a seventh-round pick out of Louisiana State in 2009. The 6-foot-3, 313-pounder was released Nov. 1 by the Green Bay Packers.